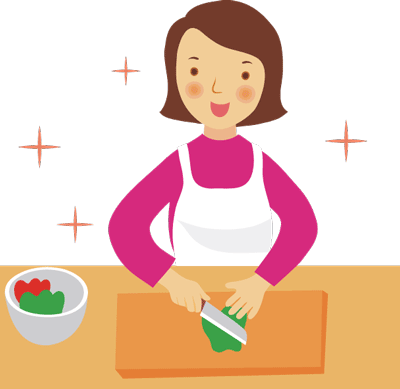 Clean up your kitchen, clean up your diet by cooking healthier. Cleaning up your kitchen will clean up your metabolic diet. It goes well beyond scrubbing and wiping and into choosing, mixing and preparing. When you have the right tools in front of you, you can make your very next meal the healthiest one yet. Not all fat is bad fat. Use up to 3 teaspoons (= 1 Tablespoon) per day of unsaturated fats that come from plant based foods such as: olive oil, sunflower oil, sesame oil, canola oil, flaxseed and grapeseed. Use your oil when you need the flavor to enhance your food. For example, in a marinade or a salad dressing. Utilize a non-stick cooking, no calorie cooking spray for foods well seasoned with herbs and spices that do not depend on the oil’s flavor. For example, as fast saute or as non-stick surface when roasting. *Coconut and palm oils are plant based but are considered a saturated fat. As much as you can, opt for fresh, organic grass fed meats and vegetables that have not been sprayed with harmful chemicals and preservatives. These are more costly, but when you stop buying the just as costly processed foods, your wallet and waistline will benefit. Substitutions can be made everywhere. Reaching for low-fat dairy items in place of the full fat versions mean you don’t have to compromise on nutrition. There seems to be more sugar-free choices now more than ever before. Use these with caution if they tend to trigger your hunger. Fresh vegetables are preferable to canned due to sodium content. Reasonable portion sizes can be hard to get a handle on in this day of super sized, deluxe meal plates. You would be surprised at the amount of food it takes to fill up and stay satisfied. Keep portion sizes in check with this “handy” thought. An approximately 3 oz. serving of meat is almost the size of the palm of your hand. A 1 cup serving of vegetables is about the size of a closed fist. Salt food as you cook it to avoid salting after it is on the table. Use salt with caution because too much can elevate blood pressure and cause fluid retention. Cook your food with fresh lemon/lime juice, vinegars, herbs and spices. Season your food after it has been cooked, there’s no limit! Be bold in you flavors. This entry was posted in Article, Tips and tagged metabolic articles, metabolic medical center by foodies4mmc. Bookmark the permalink.